Last week was HackWeek V, during which I had small goals, yet had most of the time eaten by unexpected "roadblocks." Fortunately, my memory was wrong: this works as expected. Yay. The above fails with a OptionException, because the DOS path is split, so OptionSet attempts to send 3 arguments to an option expecting 2 arguments. This isn't allowed. The patch to fix the above is trivial (most of that patch is for tests). However, the fix didn't work at first. Enter roadblock #1: String.Split() can return too many substrings. Oops. Next up, I had been sent an email showing that OptionSet had some bugs when removing by index. I couldn't let that happen...and being in a TDD mood, I first wrote some unit tests to describe what the IList<T> semantics should be. Being in an over-engineering mood, I wrote a set of "contract" tests for IList<T> in Cadenza, fixed some Cadenza bugs so that Cadenza would pass the new ListContract, then merged ListContract with the OptionSet tests. Then I hit roadblock #2 when KeyedCollection<TKey, TItem> wouldn't pass my ListContract tests, as it wasn't exception safe. Not willing to give up on ListContract, I fixed KeyedCollection so it would now pass my ListContract tests, improving compatibility with .NET in the process, which allowed me to finally fix the OptionSet bugs. I was then able to fix a mdoc export-html bug in which index files wouldn't always be updated, before starting to investigate mdoc assemble wanting gobs of memory. While pondering how to figure out why mdoc assemble wanted 400MB of memory, I asked the folks on ##csharp on freenode if there were any Mono bugs preventing their SpikeLite bot from working under Mono. They kindly directed me toward a bug in which AppDomain.ProcessExit was being fired at the wrong time. This proved easier than I feared (I feared it would be beyond me). I needed, at most, two XmlNode values from an XmlDocument. An XmlDocument loaded from a file that could be very small or large-ish (0.5MB). Thousands of such files. At once. That's when it dawned on me that storing XmlNodes in a Dictionary loaded from thousands of XmlDocuments might not be such a good idea, as each XmlNode retains a reference to the XmlDocument it came from, so I was basically copying the entire documentation set into memory, when I only needed a fraction of it. Doh! The fix was straightforward: keep a temporary XmlDocument around and call XmlDocument.ImportNode to preserve just the data I needed. Memory use plummeted to less than one tenth what was previously required. Along the way I ran across and reported an xbuild bug (since fixed), and filed a regression in gmcs which prevented Cadenza from building. Overall, a productive week, but not at all what I had originally intended. To close out this series, where did the mdoc repository format come from? It mostly came from Microsoft, actually. Taking a step back, "in the beginning," as it were, the Mono project saw the need for documentation in January 2002. I wasn't involved then, but perusing the archives we can see that csc /doc output was discarded early because it wouldn't support translation into multiple languages. NDoc was similarly discarded because it relied on csc /doc documentation. I'm sure a related problem at the time was that Mono's C# compiler didn't support the /doc compiler option (and wouldn't begin to support /doc until April 2004), so there would be no mechanism to extract any inline documentation anyway. By April 2003 ECMA standardization of the Common Language Infrastructure was apparently in full force, and the standardization effort included actual class library documentation. The ECMA documentation is available within ECMA-335.zip. The ECMA-335 documentation also included a DTD for the documentation contained therein, and it was a superset of the normal C# XML documentation. The additional XML elements provided what XML documentation lacked: information available from the assembly, such as actual parameter types, return types, base class types, etc. There was one problem with ECMA-335 XML, though: it was gigantic, throwing everything into a single 7MB+ XML file. To make this format more version-control friendly (can you imagine maintaining and viewing diffs on a 7+MB XML file? 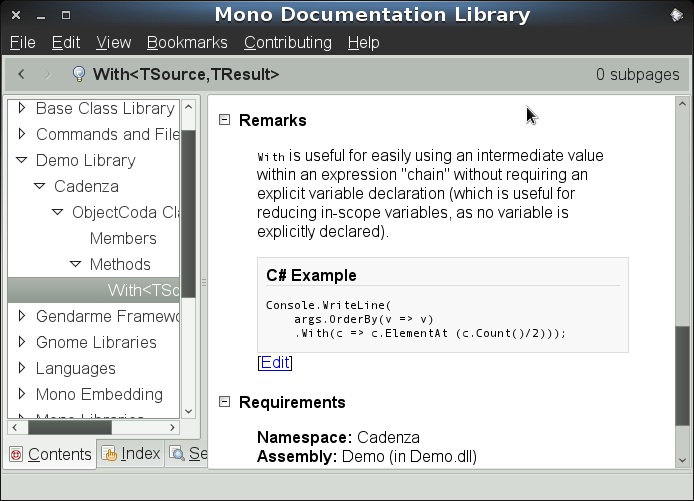 ), Mono "extended" the ECMA-335 documentation format by splitting it into one file per type. This forms the fundamental basis of the mdoc repository format (and is why I say that the repository format came from Microsoft, as Microsoft provided the documentation XML and DTD to ECMA). This is also why tools such as mdoc assemble refer to the format as ecma. The remainder of the Mono extensions were added in order to fix various documentation bugs (e.g. to distinguish between ref vs. out parameters, to better support generics), etc. In closing this series, I would like to thank everyone who has ever worked on Monodoc and the surrounding tools and infrastructure. It wouldn't be anywhere near as useful without them. Previously, we mentioned as an aside that the Type.xml files within an mdoc repository contained //AssemblyVersion elements. Today we will discuss what they're for. The //AssemblyVersion element records exactly one thing: which assembly versions a type and member was found in. (The assembly version is specified via the AssemblyVersionAttribute attribute.) With a normal assembly versioning policy, this allows monodoc to show two things: which version added the type/member, and (by inference) which version(s) removed the member. For example, consider the NetworkStream.Close method. This method was present in .NET 1.0 which overrode Stream.Close. However, in .NET 2.0 the override was removed entirely. The //AssemblyVersion attribute allows the mdoc repository to track such versioning changes; for example, consider the mdoc-generated NetworkStream.xml file. The //Member[@MemberName='Close']/AssemblyInfo/AssemblyVersion elements contain only an entry for 1.0.5000.0 (corresponding to .NET 1.1) on line 536. Compare to the //Member[@MemberName='CanWrite']/AssemblyInfo/AssemblyVersion elements (for the NetworkStream.CanWrite property) which has //AssemblyVersion elements for 1.0.5000.0 and 2.0.0.0. From this, we can deduce that NetworkStream.Close was present in .NET 1.1, but was removed in .NET 2.0. It only tracks types and members. For example, attributes, base classes, and interfaces may be added or removed across versions; these are not currently tracked. It uses the assembly version to fill the <AssemblyVersion> element. If you do this, every time you rebuild the assembly the compiler will dutifully generate a different assembly number. For example, the first time you might get a compiler version of 1.0.3666.19295, while the second recompilation the compiler will generate 1.0.3666.19375. Since mdoc assigns no meaning to the version numbers, it will create //AssemblyVersion elements for each distinct version found. The disadvantage is a major bloating of the mdoc repository, as you add at least 52*(1+M) bytes to each file in the mdoc repository for each unique assembly version (where M is the number of members within the file, as each member is separately tracked). It will also make viewing the documentation distracting; imagine seeing 10 different version numbers for a member, which all differ in the build number. That much noise would make the feature ~useless. As such, if you're going to use mdoc, I highly suggest not using auto-generated assembly version numbers. Next time, we'll wrap up this series with a history of the mdoc repository format. Last time we discussed configuring the ASP.NET front-end to display monodoc documentation. The display of extension methods within monodoc and the ASP.NET front-end is fully dynamic. This has it's pros and cons. On the pro side, if/when you install additional assembled documentatation sources, those sources will be searched for extension methods and they will be shown on all matching types. This is very cool. On the con side, searching for the extension methods and converting them into HTML takes time -- there is a noticable delay when viewing all members of a type if there are lots of extension methods. On heavily loaded servers, this may be detrimental to overall performance. If you're running the ASP.NET front-end, you're not regularly adding documentation, and you have Mono 2.6, you can use the mdoc export-html-webdoc command to pre-render the HTML files and cache the results. This will speed up future rendering. In a world where links need to take less than 0.1 seconds to be responsive, this is...pretty bad. That's nearly 40x faster, and within the 0.1s guideline. This will create a directory tree within $prefix/lib/monodoc/sources/cache/Demo. Restarting the ASP.NET front-end will allow it to use the cache. If you don't want to generate the cache in another directory, use the -o=PREFIX option. This is useful if you're updating an existing cache on a live server and you don't want to overwrite/replace the existing cache (it's a live server!) -- generate the cache elsewhere, then move the files when the server is offline. The existence of the cache subdirectories are more important than any timestamps; if the .zip file is newer than the corresponding cache directory, the cache contents will still be returned. It's privy to monodoc internals, and thus you may need to regenerate all cached documentation whenever you add or remove .zip files. For example, since it can be used to show extension methods, and any set of documentation can contain extension methods, adding or removing assembled documentation files may render the cached output out of date. mdoc export-html-webdoc processing is slow. Processing the 2.4KB Demo.zip takes a speedy 1.2s. Processing the 5.8MB netdocs.zip (51MB uncompressed, containing 4810 types with 45267 members, including List<T> documentation) takes an astounding 247m (over 4 hours). The resulting cache/netdocs directory is 316MB. Next time, we'll cover mdoc's support for assembly versioning. Last time, we assembled our documentation and installed it for use with monodoc. This is a prerequisite for ASP.NET support (as they both use the same system-wide documentation directory). You will need to change the svn co command to use the same version of Mono that is present on your system. For example, if you have Mono 2.6 installed, change the mono-2-4 to mono-2-6. For "real" use, setting up using Apache with mod_mono may be preferred (or any of the other options listed at Mono's ASP.NET support page). Configuring mod_mono or anything other than xsp2 is beyond my meager abilities. Next time, we'll discuss improving the ASP.NET front-end's page rendering performance. We previously discussed exporting the mdoc repository into static HTML files using mdoc export-html and into a Microsoft XML Documentation file with mdoc export-msxdoc. Today, we'll discuss exporting documentation with mdoc assemble. Unfortunately we're taking a diversion from the Windows world, as the monodoc browser and the ASP.NET front-end won't run under Windows (due to limitations in the monodoc infrastructure). I will attempt to fix these limitations in the future. -f=FORMAT is used to specify the format of the files to assemble. When documenting assemblies you can skip this, as the default format is for mdoc repositories. This is useful if you want to assemble other materials, such as man pages or plain HTML files. -o=PREFIX is used to specify the output prefix. mdoc assemble generates two files, a .tree and a .zip file. The PREFIX value is the basename to use for these to files. The list of files or directories to process. Whether these need to be files or directories (and related semantics) depends upon the format specified; see the FORMATS section of the mdoc-assemble(1) man page for details. This will create the files Demo.tree and Demo.zip in the current working directory. label is the text to display in the tree view. name is the name of the node, so that other nodes and the /monodoc/source/@path attribute may refer to it. languages for programming language references, e.g. The C# Language Specification. libraries for class library documentation. man for man pages and other command references. tools and various for anything that doesn't fit in the above descriptions. If not specified and this is the /monodoc/node element, this defaults to the various node. If this is a nested //node element, the @parent attribute defaults to the parent //node element (../@name). basefile is the file basename of the .tree and .zip files. path is the //node/@name value that will be associated with the docs within basefile.tree and basefile.zip. provider is the format provided to mdoc assemble. For assembly documentation, this should be ecma. In fact, we will see With() listed as an extension method on all types (which is arguably a bug, as static types can't have instance methods...). Examples of mdoc export-html listings of extension methods can be found in the mdoc unit tests and the Cadenza.Collections.CachedSequence<T> docs (which lists a million extension methods because Cadenza.Collections.EnumerableCoda contains a million extension methods on IEnumerable<T>). Next time, we'll discuss setting up the ASP.NET front end under Linux. Previously, we discussed how to write documentation and get it into the documentation repository. We also discussed exporting the documentation into static HTML files using mdoc export-html. Today, we'll discuss mdoc export-msxdoc. mdoc export-msxdoc is used to export the documentation within the mdoc repository into a .xml file that conforms to the same schema as csc /doc. This allows you, if you so choose, to go entirely to externally managed documentation (instead of inline XML) and still be able to produce your Assembly.xml file so that Visual Studio/etc. can provide code completion against your assembly. The primary difference between these is what files are generated. Within each Type.xml file of the mdoc repository (e.g. ObjectCoda.xml) is a /Type/AssemblyInfo/AssemblyName element. The first command (lacking -o Demo.xml) will generate a set of .xml files, where the filenames are based on the values of the /Type/AssemblyInfo/AssemblyName element values, in this case Demo.xml. Additionally, a NamespaceSummaries.xml file is generated, containing documentation for any namespaces that were documented (which come from the ns-*.xml files, e.g. ns-Cadenza.xml). The second command (which specifies -o Demo.xml) will only generate the specified file (in this case Demo.xml). For this mdoc repository, there is no actual difference between the commands (as only one assembly was documented within the repository), except for the generation of the NamespaceSummaries.xml file. However, if you place documentation from multiple assemblies into the same mdoc repository, the first command will properly generate .xml files for each assembly, while the latter will generate only a single .xml file containing the documentation from all assemblies. Next time, we'll cover mdoc assemble. Last time, we wrote documentation for our Demo.dll assembly. What if we want to improve the looks of those docs, e.g. to change the colors or add additional navigation links for site consistency purposes? --ext=FILE-EXTENSION is used to change the file extension of generated files from .html to FILE-EXTENSION. This is useful if you want to generate e.g. .aspx files instead of .html files (the default). --template=TEMPLATE-FILE specifies an XSLT to use for the layout of all generated files. If not specified, then the XSLT returned by mdoc export-html --default-template is used. HTML CSS class names are used throughout the documentation, allowing various elements to be customized by providing an alternate stylesheet. The mdoc export-html man page lists the CSS classes that are used. Contains the Assembly and Namespace name links. Contains the type <summary/> documentation. Contains the type signature, e.g. whether it's a struct or class, implemented interfaces, etc. Contains the documentation for all of the members of the type, including a table for all of the members. Contains copyright information taken from the mdoc repository, specifically from index.xml's /Overview/Copyright element. By providing a custom --template XSLT and/or by providing an additional CSS file, you have some degree of control over the resulting documentation. I'll be the first to admit that this isn't a whole lot of flexibility; there is no control over what CSS class names are used, nor is there any control over what is generated within the /Page//* elements. What this model does allow is for controlling the basic page layout, e.g. to add a site-wide menu system, allowing documentation to be consistent with the rest of the site. For example, my site uses custom templates to provide a uniform look-and-feel with the rest of their respective sites for the Mono.Fuse and NDesk.Options documentation. Next time, we'll cover mdoc export-msxdoc. Previously, I mentioned that you could manually edit the XML files within the mdoc repository. What I neglected to mention is that there are only parts of the XML files that you should edit, and that there is an XML Schema file available for all docs. The mdoc(5) man page lays out which files within the repository (and which parts of those files) are editable. In summary, all ns-*.xml files and the //Docs nodes of all other .xml files are editable, and they should contain ye normal XML documentation elements (which are also documented within the mdoc(5) man page). The XML Schema can be found in Mono's SVN, at http://anonsvn.mono-project.com/source/trunk/mcs/tools/mdoc/Resources/monodoc-ecma.xsd. Last time, we create an assembly and used mdoc to generate a documentation repository containing stubs. Stubs have some utility -- you can view the types, members, and parameter types that are currently present -- but they're far from ideal. We want actual documentation. Unfortunately, mdoc isn't an AI, and can't write documentation for you. It manages documentation; it doesn't create it. Manually edit the XML files within the repository directory (if following from last time, this would be all .xml files within the Documentation/en directory. We can continue writing XML documentation within our source code. Manually editing the files should be self-explanatory; it's not exactly ideal, but it works, and is how I write most of my documentation. When using monodoc --edit Documentation/en, the contents of Documentation/en will be shown sorted in the tree view by it's assembly name, e.g. in the Mono Documentation → Demo node. When viewing documentation, there are [Edit] links that, when clicked, will allow editing the node (which directly edits the files within Documentation/en. However, I can't recommend monodoc as an actual editor. It's usability is terrible, and has one major usability flaw: when editing method overloads, most of the documentation will be the same (or similar enough that you'll want to copy everything anyway), e.g. <summary/>, <param/>, etc. The monodoc editor doesn't allow copying all of this at once, but only each element individually. It makes for a very slow experience. ///  Extension methods on <see cref="T:System.Object" />. ///   A <typeparamref name="TSource" /> containing the value to manipulate. ///   invoked with <paramref name="self" /> as a parameter. ///   Supports chaining otherwise temporary values. ///     variable is explicitly declared). ///   <paramref name="selector" /> is <see langword="null" />. Now when we view ObjectCoda.xml, we can see the documentation that was present in the source code. What's going on here? What's going on is that mdoc will search for all <code/> elements. If they contain a //code/@src attribute, the specified file is read in and inserted as the //code element's value. The filename specified in the //code/@src attribute is relative to the documentation repository root. A further extension is that, for C# code, if the filename has an "anchor", a #region block of the same name is searched for within the source code. This makes keeping documentation examples actually compiling trivial to support. For example, I'll have documentation refer to my unit tests, e.g. One final point worth mentioning: you can import documentation as often as you want. The imported documentation will always overwrite whatever is already present within the documentation repository. Consequently, if you want to use mdoc for display purposes but want to continue using inline XML documentation, always import the compiler-generated .xml file. Next time, we'll cover customizing the static HTML output. mdoc is an assembly-based documentation management system, which recently added support for .NET . I say "assembly based" because an alternative is source-based, which is what "normal" C# XML documentation, JavaDoc, and perlpod provide. Unlike these source-based systems, in mdoc documentation for public types and members are not present within source code. Instead, documentation is stored externally (to the source), in a directory of XML files (hereafter refered to as the mdoc repository). to assemble the mdoc repository for use with the Monodoc Documentation Browser and the ASP.NET front-end. The compiler-generated /doc XML contains no type information. Having types is very useful for HTML output/etc., so the type information must come from somewhere. Said "somewhere" could be the actual assemblies being documented, but this has other downsides (e.g. it would complicate supporting different versions of the same assembly). mdoc uses the repository to contain both documentation and full type information, so that the source assemblies are only needed to update the repository (and nothing else). Which provides enough background to get to the point: why use mdoc? You would primarily want to use mdoc if you want to view your documentation outside of an IDE, e.g. within a web browser or stand-alone documentation browser. Most mdoc functionality is geared toward making documentation viewable (e.g. mdoc export-html and mdoc assemble), and making the documentation that is viewed more useful (such as the full type information provided by mdoc update and the generation of <exception/> elements for documentation provided by mdoc update --exceptions). Next time, we'll discuss how to use mdoc. How should documentation be created and distributed? Would Monodoc be a better approach? Thus I pondered, "how well does mdoc support Windows users?" The answer: not very well, particularly in an interop scenario. So, lots of bugfixing and a false-start later, and I'd like to announce mdoc for .NET. All the power of mdoc, cross-platform. Always generate Unix line endings within mdoc-generated XML files. This allows directories to be shared between Windows and Linux (e.g. with Samba) without causing lots of differences due to end-of-line changes. Fix the mdoc export-html XML stylesheets so that they would work under .NET (as mdoc uses XSLT and started relying on several Mono bugs). Add support for properly converting <see cref="N:SomeNamespace"/> links into HTML links. Next time, we'll cover what mdoc is, and why you'd want to use it. NerdDinner is an ASP.NET MVC sample, licensed under the Ms-PL with sources hosted at CodePlex. Back on May 14th, I wrote that NerdDinner could be run under Mono using trunk. Build (or otherwise obtain) Mono 2.6. The Parallel Mono Environments page may be helpful. Only the web portion runs under Mono, as does the data access layer (System.Data.Linq, more affectionately known as Linq to SQL). The database is still Microsoft SQL Server. Go forth and configure the NerdDinner server (if you don't already have one configured). You will need to adjust the machine name in the Data Source parameter to contain your actual computer name, and change the User ID and Password to whatever values you chose when configuring SQL Server. Configure a MembershipProvider for NerdDinner username/password storage. The MONO_IOMAP environment variable is needed because some link targets used within NerdDinner require case insensitivity. In the Allowed Services area, add the HTTP Server and Mono XSP2 ASP.NET Host Service services. One other oddity I encountered is that a url of http://localhost:8080 isn't permitted; using telnet(1) shows that it attempts to connect to ::1... (i.e. a IPv6 address), and the connection is refused. Instead, I needed to connect to http://127.0.0.1:8080. One of the new features that will be present in MonoTouch 1.2 is inclusion of the System.Data and Mono.Data.Sqlite assemblies. This is a preview release of System.Data et. al; it may not fully work. Known limitations are at the end of this post. Mono.Data.Sqlite.dll: Unchanged, but see below. The above code creates the Documents/mydb.db3 SQLite database, populates it if it doesn't already exist, then executes a SQL query against the database using normal, standard, ADO.NET mechanisms. Functionality is missing from System.Data.dll and Mono.Data.Sqlite.dll. The System.EnterpriseServices.dll dependency was removed from System.Data.dll, resulting in the removal of the SqlConnection.EnlistDistributedTransaction(ITransaction) method. Where are these functions used (i.e. what can't you use from Mono.Data.Sqlite)? These appear to be related to database schema querying, e.g. determining at runtime which columns exist on a given table, such as Mono.Data.Sqlite.SqliteConnection.GetSchema (overriding DbConnection.GetSchema) and Mono.Data.Sqlite.SqliteDataReader.GetSchemaTable (overriding DbDataReader.GetSchemaTable). In short, it seems that anything using DataTable is unlikely to work. Why not? We realize that there are pre-existing SQLite solutions, but felt that many people would prefer to use the ADO.NET code they're already familiar with. Bringing System.Data and Mono.Data.Sqlite to MonoTouch permits this. Data binding with e.g. a UITableView is not currently implemented. Hope you enjoy this preview! 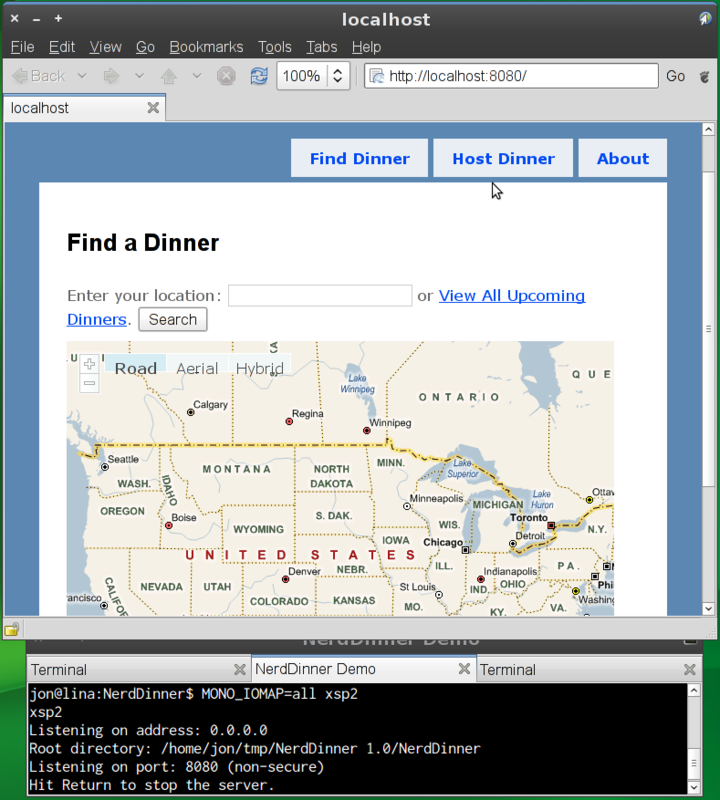 It is now possible to run the web portions of NerdDinner 1.0 on Linux with Mono trunk, thanks to Marek Habersack and Gonzalo Paniagua Javier's help with Mono's ASP.NET and ASP.NET MVC support, and the DbLinq community's assistance with Linq to SQL support. This shows a growing level of maturity within Mono's Linq to SQL implementation. Build Mono from trunk. The Parallel Mono Environments page may be helpful. Copy the NerdDinner_log.ldf and NerdDinner.mdf files from the $HOME/tmp/NerdDinner 1.0/NerdDinner/App_Data directory to your Windows machine, e.g. C:\tmp. Within Windows Explorer, go to C:\tmp, right-click the C:\tmp folder, click Properties, click the Security tab, click Edit..., and add the Full Control, MOdify, Read & execute, List folder contents, Read, and Write permissions to the User group. Click OK.
Repeat the above permissions modifications for the NerdDinner_log.ldf and NerdDinner.mdf files in C:\tmp. Start Microsoft SQL Server Management Studio (Start → All Programs → Microsoft SQL Server 2008 → SQL Server Management Studio). Connect to your database instance. Within the Attach Databases dialog, click the Add... button, and choose C:\tmp\NerdDinner.mdf in the Locate Database Files dialog. Click OK in both the Locate Database Files dialog and the Attach Databases dialog. Start Microsoft SQL Server Management Studio. Within the Object Explorer, right-click the database name and click Properties. In the Server Properties dialog, select the Security page. In the Server authentication section, select the SQL Server and Windows Authentication mode radio button. Restart SQL Server by right-clicking on the database name and clicking Restart. Within SQL Server Management Studio, connect to the database instance. Within the Object Explorer, expand the Security → Logins tree node. In the Login - New dialog, enter a login name. We'll use jonp for discussion purposes. Select the SQL Server authentication dialog button, and enter a password in the Password and Conform Password text boxes. For discussion purposes we'll use 123456. Still within the Login - New dialog, select the User Mapping page. In the Users mapped to this login section, select the checkbox in the Map column corresponding to the NerdDinner database. Within the Database role membership for: NerdDinner section, select the db_datareader and db_datawriter roles. Click OK.
Start SQL Server Configuration Manager (Start → All Programs → Microsoft SQL Server 2008 → Configuration Tools → SQL Server Configuration Manager). In the left-hand pane, select the SQL Server Configuration manager (Local) → SQL Server Network Configuration → Protocols for Database Instance Name node. In the right pane, double click the TCP/IP Protocol Name. In the Protocol tab, set Enabled to Yes. Click OK. In the left-hand pane, go to the SQL Server Configuration Manager (Local) → SQL Server Services node. In the right pane, double-click SQL Server Browser. In the Service tab, set the Start Mode property to Automatic. Click OK.
Right-click SQL Server Browser, and click Start. Right-click SQL Server, and click Restart. Within Windows Control Panel, open the Windows Firewall applet. In the Windows Firewall Settings dialog, click the Exceptions tab. You will need to adjust the machine name in the Data Source parameter to contain your actual computer name, and change the User ID and Password to whatever values you chose in §5.E.iv. Mono 2.4 was released, and among the unlisted changes was that mdoc-update has migrated from using Reflection to using Mono.Cecil. There are multiple advantages and disadvantages to this migration. The disadvantages include slower execution (when I tested, Mono.Cecil took ~10% longer to do the same task as Reflection) and increased dependencies (Mono.Cecil is now required). I believe that these disadvantages are outweighed by the advantages. Firstly, the migration makes my life significantly easier. One of the major limitations of Reflection is that only one mscorlib.dll can be loaded into a process. This means that, in order to support generating documentation from mscorlib.dll 1.0, there needs to be a version of mdoc-update that runs under .NET 1.0. Similarly, to document mscorlib.dll 2.0, I need a different version of mdoc-update which runs under .NET 2.0. And when .NET 4.0 is released (with yet another version of mscorlib.dll), I'll need...yet another version of mdoc-update to run under .NET 4.0. This is less than ideal, and using Mono.Cecil allows me to have one program which supports every version of mscorlib.dll. This also means that I can use C# 3.0 features within mdoc-update, as I no longer need to ensure that (most of) mdoc-update can run under the .NET 1.0 profile. For everyone else, the most important result of the Mono.Cecil migration is that mdoc-update now has a suitable base for advanced documentation generation scenarios which make use of IL analysis. The first feature making use of it is new --exceptions functionality, which analyzes member IL to determine which exceptions could be generated, and creates stub <exception/> XML documentation based on that analysis. This feature is experimental (see the documentation), and contains a number of corner cases, but I've already found it useful for writing Mono.Rocks documentation. .NET 3.5 introduced Language Integrated Query (LINQ), which allowed for querying groupings of data across diverse "paradigms" -- collections (arrays, lists, etc. ), XML, and relational data, called LINQ to SQL. LINQ to SQL support is within the System.Data.Linq assembly, which is one of the assemblies Mono is currently implementing. However, LINQ to SQL has one limitation: it only works with Microsoft SQL Server and Microsoft SQL Server Compact Edition, leaving numerous other databases users unable to use this assembly. Enter DbLinq, an effort to provide LINQ to SQL functionality for other databases, including Firebird, Ingres, MySQL, Oracle, PostgreSql, SQLite, and SQL Server. DbLinq provides a System.Data.Linq-compatible implementation for these databases (compatible implying the same types and methods, but located within a different namespace). Which brings us to Mono. Mono is using DbLinq as the foundation for Mono's System.Data.Linq.dll implementation, allowing Mono's System.Data.Linq.dll to support all the databases that DbLinq supports. Mono also has sqlmetal (based on DbLinq's DbMetal.exe sources), which can be used to generate C# types to interact with databases. MonoDevelop can load the DbLinq solutions. However, it has a problem with building all of the projects within the solution. At the time of this writing, MonoDevelop can build the following assemblies: DbLinq.dll, DbLinq.Sqlite_test_mono_strict.dll, DbLinq.SqlServer.dll, DbLinq.SqlServer_test.dll, DbLinq.SqlServer_test_ndb.dll, DbLinq.SqlServer_test_strict.dll, and DbLinq_test_ndb_strict.dll. The *_test* assemblies are unit tests, so this leaves the core DbLinq.dll assembly and SQL Server support. Most of the tests require an accessible database, so I've been limiting my current tests to SQLite (as setup is easier). As mentioned before, DbLinq is being used to implement Mono's System.Data.Linq.dll. (For those reading the DbLinq source, the Mono-specific bits are within MONO_STRICT conditional code.) This allows us to write code that depends only on .NET assemblies (though this is of dubious value, as the mechanisms used to support SQLite and other databases won't work with .NET proper, but it's still a cute trick). To play along, you'll need Mono trunk. Notice that we use the database connection string to specify the database vendor to use, specifically the DbLinqProvider value specifies the database vendor, and must be present when connecting to a database other than Microsoft SQL Server (which is the default vendor). If using the DataContext(string) constructor directly (and not through a generated subclass as used above), you should also provide the DbLinqConnectionType parameter, which is the assembly-qualified type name to use for the IDbConnection implementation. This allows you to use multiple different IDbConnection implementations that use similar SQL implementations, e.g. Mono.Data.Sqlite.dll and System.Data.SQLite.dll, both of which wrap the SQLite database. C# 3.0 adds a new language feature called extension methods. Extension methods allow the "addition" of new instance methods to any type, without modifying the type itself. This is extremely powerful, arguably crack-adled, and exists because Visual Studio users can't do anything without code completion (tongue firmly in cheek). It's also extremely useful, permitting LINQ and the even more crack-adled thinking in Mono.Rocks (much of which I wrote, and I'm not entirely sure if the "crack" is in jest or not; sometimes I wonder...). // imploded == "This is my sentence." Extension methods are entirely syntactic sugar. (Nice syntactic sugar, nonetheless...). As such, it doesn't in any way modify the type that is being extended. Consequently, it cannot access private members, nor is the extension method returned when reflecting over the extended type. For example, typeof(string).GetMethod("Implode") will return null, as System.Array doesn't have an Implode method. Furthermore, extension methods are only available if you have a using declaration for the namespace the extension method type resides in. So if the above MyExtensions type resides in the Example namespace, and a source file doesn't have using Example;, then the Implode extension method isn't available. Earlier I alluded that Visual Studio users can't do anything without code completion. Extension methods are thus a boon, as they (potentially) make it easier to find new functionality, as no new types need to be introduced or known about in advance. However, you still need to have an appropriate using declaration to bring the methods "in scope," so how does a developer know what namespaces to use? The same way a developer knows which type to use for anything: documentation. MSDN online documentation has been enhanced to show which extension methods are applicable for a given type, e.g. The extension methods for IEnumerable<T>. 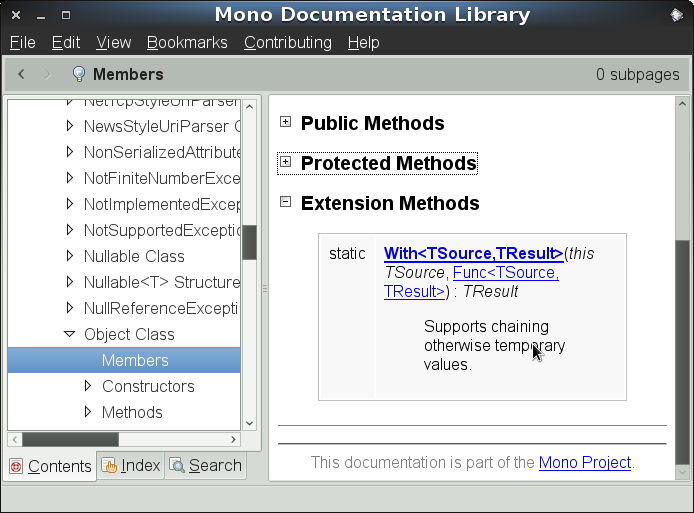 Mono has similar documentation support. This isn't particularly interesting, though. Part of the utility and flexibility is that any type, in any namespace, can be extended with extension methods, and the extension methods themselves can be contained in any type. Obviously, MSDN and Mono documentation online can't know about extension methods that are not part of the core framework. Thus, if the e.g. Mono.Cecil or Gendarme frameworks provided extension methods, the online documentation sites won't be helpful. Mono Documentation Tools: the Mono Documentation framework has been upgraded to support documenting generics and extension methods. Enhancing mdoc update to generate an /Overview/ExtensionMethods element within index.xml. The /Overview/ExtensionMethods element contains <ExtensionMethod/> elements which in turn contains //Targets/Target elements specifying which types the extension method is an instance method on, and a <Member/> element which is a subset of the actual extension method documentation. Developers don't need to edit this copy; it's handled entirely by mdoc update. Enhancing mdoc assemble to look for the //ExtensionMethod elements and insert them into the ExtensionMethods.xml file within the generated .zip file. Enhancing the XML documentation to HTML generation process so that the extension methods are listed. This allows all of monodoc and mod, online documentation, and mdoc export-html to use the underlying infrastructure. Enhance monodoc.dll to load all ExtensionMethods.xml files from all installed .zip files. This the allows monodoc and online documentation mechanisms to show extension methods for all installed documentation sources. The short of it is that this requires no workflow change to get extension methods listed on all extended types. Just create extension methods, document them as if they were normal static methods (as they are normal static methods, and can be invoked as such), assemble the documentation, and install the documentation. There is one wrinkle, though: since the index.xml file contains a subset of the <Member/> documentation, you need to rerun mdoc update after editing extension method documentation so that index.xml will have the correct documentation when mdoc assemble is run. Otherwise the "summary" extension method documentation may differ from the actual intended documentation. This may be improved in a future release. Context: for years, Mono has been the target of FUD because of potential software patent issues. For years the Mono community has attempted to defend from these attack, sometimes successfully. Recently, someone asked on mono-list about ways to pre-emptively answer the FUD so that it would become a non-issue. I responded, and had several people suggest that I blog it. Here we go. The anti-Mono FUDsters apparently can't see the forest for the trees. I imagine that most people reading this will agree with the first three points, so it is the fourth that I will attempt to focus on. Specifically, the anti-Mono FUDsters seem to spend so much time on a tree (Microsoft) that they either miss or minimize the forest of actual patent problems, patent trolls, etc. A long time ago, Wang created a patent that "covered a method by which a program can get help from another computer application to complete a task." Microsoft licensed the patent from Wang. Sun did not. In 1997, Eastman Kodak Company bought Wang, thus acquiring this patent. Kodak then sued Sun, claiming that Java infringed this patent. Kodak won, and they later settled out of court. Now, for my non-serious steaming pile of FUD, in the form of a question: Did Sun acquire the ability to sublicense these patents from Kodak? If Sun can sublicense the patents, then GPL'd Java is fine. If Sun can't, then Java cannot be GPL'd, and any company making use of Java could be subject to a lawsuit from Kodak. It Doesn't Matter. Anyone can hold a patent, for anything, and sue anyone at any time. Thus, Gnome is not free of patent issues, KDE is not free of patent issues, Linux is not free of patent issues, Python is not free of patent issues, Ruby is not free of patent issues.... Nothing is free of patent issues. Having said the above, a related question becomes: How do you avoid violating someone's patents? You don't (insert more laughter). You could try restricting yourself to only using software that's at least 20 years old, but you won't gain many users that way. It also won't work, for at least two reasons: (1) submarine patents -- not all patents that would have been in effect 20 years ago have necessarily expired (though submarine patents shouldn't exist for ~too much longer); and (2) look at the drug patent industry, where to prevent patented drugs from "going generic" the drug companies take the patent-expired drug(s), combine them with other drugs, then patent the result. I don't think it will take too long for Software companies to start doing this if they feel that it's necessary, and once they do, even using known-patent-expired programs won't be safe, as merely combining them together may be covered by an unexpired patent. Yay. With all this in mind, you can see why patent FUD is hard to fight, because there's no way to dismiss it. Software patents are a reality, they're ugly, but they can't be avoided. (Yet they must be ignored, to avoid increased liability.) My problem is that the anti-Mono people only seem to focus on patents with respect to Mono and Microsoft, ignoring the rest of the software industry. They're ignoring the (gigantic) forest so that they can pay attention to a single tree, Microsoft. What I find even "funnier" is that Microsoft supposedly holds a number of patents in a number of areas frequently used by open-source projects, such as HTML, CSS, C++, XML, and others. So why don't we ever see any suggestions to avoid these technologies because the Big Bad Microsoft might sue? For that matter, (again) considering how vague software patents tend to be, wouldn't many Microsoft patents on .NET stand a chance at being applicable toward Java, Python, and other projects? (Again) Why just focus on Mono? Final note: I am a Software Engineer, not a patent lawyer. Feel free to ignore the entire rant, but I would appreciate it if a little more thought went into all the anti-Mono propaganda. Then, in a wrapping binge, I exposed it for use in C# with Stdlib.signal(), so that C# code could register signal handlers to be invoked when a signal occurred. The problem? By their very nature, signals are asynchronous, so even in a single-threaded program, you had to be very careful about what you did, as your "normal" thread was certainly in the middle of doing something. For example, calling malloc(3) was almost certainly a bad idea, because if the process was in the middle of a malloc call already, you'd have a reentrant malloc call which could corrupt the heap. This reentrant property impacts all functions in the process, including system calls. Consequently, a list of functions that were "safe" for invocation from signal handlers was standardized, and is listed in the above signal man page; it includes functions such as read(2) and write(2), but not functions like e.g. pwrite(2). Consequently, these limitations and a few other factors led to the general recommendation that signal handlers should be as simple as possible, such as writing to global variable which the main program occasionally polls. What's this have to do with Stdlib.signal(), and why was it a mistake to expose it? The problem is the P/Invoke mechanism, which allows marshaling C# delegates as a function pointer that can be invoked from native code. When the function pointer is invoked, the C# delegate is eventually executed. // block until a SIGINT or SIGTERM signal is generated. This isn't as powerful as the current Stdlib.signal() mechanism, but it is safe to use, doesn't lead to potentially ill-defined or unwanted behavior, and is the best that we can readily provide for use by managed code. Mono.Unix.UnixSignal is now in svn-HEAD and the mono-1-9 branch, and should be part of the next Mono release. An occasional question on #mono@irc.gnome.org and ##csharp@irc.freenode.net is whether Mono will support mixed-mode assemblies, as generated by Microsoft's Managed Extensions for C++ compiler (Visual Studio 2001, 2003), and C++/CLI (Visual Studio 2005, 2008). The answer is no, and mixed mode assemblies will likely never be supported. First, what's a mixed mode assembly? A mixed mode assembly is an assembly that contains both managed (CIL) and unmanaged (machine language) code. Consequently, they are not portable to other CPU instruction sets, just like normal C and C++ programs and libraries. Next, why use them? The primary purpose for mixed mode assemblies is as "glue", to e.g. use a C++ library class as a base class of a managed class. This allows the managed class to extend unmanaged methods, allowing the managed code to be polymorphic with respect to existing unmanaged functions. This is extremely useful in many contexts. However, as something like this involves extending a C++ class, it requires that the compiler know all about the C++ compiler ABI (name mangling, virtual function table generation and placement, exception behavior), and thus effectively requires native code. If the base class is within a separate .dll, this will also require that the mixed mode assembly list the native .dll as a dependency, so that the native library is also loaded when the assembly is loaded. The other thing that mixed mode assemblies support is the ability to export new C functions so that other programs can LoadLibrary() the assembly and GetProcAddress the exported C function. Both of these capabilities require that the shared library loader for the platform support Portable Executable (PE) files, as assemblies are PE files. If the shared library loader supports PE files, then the loader can ensure that when the assembly is loaded, all listed dependent libraries are also loaded (case 1), or that native apps will be able to load the assembly as if it were a native DLL and resolve DLL entry points against it. This requirement is met on Windows, which uses the PE file format for EXE and DLL files. This requirement is not met on Linux, which uses ELF, nor is it currently met on Mac OS X, which uses Mach-O. So why can't mixed mode assemblies be easily supported in Mono? Because ld.so doesn't like PE. The only workarounds for this would be to either extend assemblies so that ELF files can contain both managed and unmanaged code, or to extend the shared library loader to support the loading of PE files. Using ELF as an assembly format may be useful, but would restrict portability of such ELF-assemblies to only Mono/Linux; .NET could never make use of them, nor could Mono on Mac OS X. Similarly, extending the shared library loader to support PE could be done, but can it support loading both PE and ELF (or Mach-O) binaries into a single process? What happens if a PE file loaded into an "ELF" process requires KERNEL32.DLL? Extending the shared library loader isn't a panacea either. This limitation makes mixed mode assemblies of dubious value. It is likely solvable, but there are for more important things for Mono to focus on. If you develop command-line apps, parsing the command-line is a necessary evil (unless you write software so simple that it doesn't require any options to control its behavior). Consequently, I've written and used several parsing libraries, including Mono.GetOptions, Perl's Getopt::Long library, and some custom written libraries or helpers. So what's wrong with them? The problem with Mono.GetOptions is that it has high code overhead: in order to parse a command line, you need a new type (which inherits from Mono.GetOptions.Options) and annotate each field or property within the type with an Option attribute, and let Mono.GetOptions map each command-line argument to a field/property within the Options subclass. See monodocer for an example; search for Opts to find the subclass. The type-reflector parser is similarly code heavy, if only in a different way. The Mono.Fuse, lb, and omgwtf parsers are one-offs, either specific to a particular environment (e.g. integration with the FUSE native library) or not written with any eye toward reuse. The above may be somewhat cryptic at first, but it's short, concise, and lets you know at a glance that it takes three sets of arguments, one of which takes a required string parameter (the file option). Options.cs has the goods, plus unit tests and additional examples (via the tests). Options is both more and less flexible than Getopt::Long. It doesn't support providing references to variables, instead using a delegate to do all variable assignment. In this sense, Options is akin to Getopt::Long while requiring that all options use a sub callback (as the v|verbose option does above). Parameters of the form: -flag, --flag, /flag, -flag=value, --flag=value, /flag=value, -flag:value, --flag:value, /flag:value, -flag value, --flag value, /flag value. "boolean" parameters of the form: -flag, --flag, and /flag. Boolean parameters can have a `+' or `-' appended to explicitly enable or disable the flag (in the same fashion as mcs -debug+). For boolean callbacks, the provided value is non-null for enabled, and null for disabled. "value" parameters with a required value (append `=' to the option name) or an optional value (append `:' to the option name). The option value can either be in the current option (--opt=value) or in the following parameter (--opt value). The actual value is provided as the parameter to the callback delegate, unless it's (1) optional and (2) missing, in which case null is passed. "bundled" parameters which must start with a single `-' and consists of only single characters. In this manner, -abc would be a shorthand for -a -b -c.
Option processing is disabled when -- is encountered. All un-handled parameters are returned from the Options.Parse method, which is implemented as an iterator (hence the calls to .ToArray() in the above C# examples, to force processing). That's not an ideal solution, as MSDN is/was slow. Very slow. Many seconds to load a single page slow. (And if you've ever read the .NET documentation on MSDN where it takes many page views just to get what you're after... You might forget what you're looking for before you find it.) A local documentation browser is useful. Fortunately, the ECMA 335 standard comes to the rescue (somewhat): it includes documentation for the types and methods which were standardized under ECMA, and this documentation is freely available and re-usable. The ECMA documentation consists of a single XML file (currently 7.2MB) containing all types and type members. This wasn't an ideal format for writing new documentation, so the file was split up into per-type files; this is what makes up the monodoc svn module (along with many documentation improvements since, particularly types and members that are not part of the ECMA standard. However, this ECMA documentation import was last done many years ago, and the ECMA documentation has improved since then. (In particular, it now includes documentation for many types/members added in .NET 2.0.) We had no tools to import any updates. Shortly after the ECMA documentation was originally split up into per-type files, Mono needed a way to generate documentation stubs for non-ECMA types within both .NET and Mono-specific assemblies. This was (apparently) updater.exe. Eventually, Joshua Tauberer created monodocer, which both creates ECMA-style documentation stubs (in one file/type format) and can update documentation based on changes to an assembly (e.g. add a new type/member to an assembly and the documentation is updated to mention that new type/member). By 2006, monodocer had (more-or-less) become the standard the generating and updating ECMA-style documentation, so when I needed to write Mono.Fuse documentation I used monodocer...and found it somewhat lacking in support for Generics. Thus begins my work on improving monodocer. Fast-forward to earlier this year. Once monodocer could support generics, we could generate stubs for all .NET 2.0 types. Furthermore, ECMA had updated documentation for many core .NET 2.0 types, so...what would it take to get ECMA documentation re-imported? This turned out to be fairly easy, with supported added in mid-May to import ECMA documentation via a -importecmadoc:FILENAME parameter. The problem was that this initial version was slow; quoting the ChangeLog, "WARNING: import is currently SLOW." How slow? ~4 Minutes to import documentation for System.Array. This might not be too bad, except that there are 331 types in the ECMA documentation file, documenting 3797 members (fields, properties, events, methods, constructors, etc.). 4 minutes per type is phenominally slow. Why was it so slow? -importecmadoc support was originally modeled after -importslashdoc support, which is as follows: lookup every type and member in System.Reflection order, create an XPath expression for this member, and execute an XPath query against the documentation we're importing. If we get a match, import the found node. The slowdown was twofold: (1) we loaded the entire ECMA documentation into a XmlDocument instance (XmlDocument is a DOM interface, and thus copies the entire file into memory), and (2) we were then accessing the XmlDocument randomly. The first optimization is purely algorithmic: don't import documentation in System.Reflection order, import it in ECMA documentation order. This way, we read the ECMA documentation in a single pass, instead of randomly. As is usually the case, algorithmic optimizations are the best kind: it cut down the single-type import from ~4 minutes to less than 20 seconds. I felt that this was still too slow, as 20s * 331 types is nearly 2 hours for an import. (This is actually faulty reasoning, as much of that 20s time was to load the XmlDocument in the first place, which is paid for only once, not for each type.) So I set out to improve things further. First was to use a XPathDocument to read the ECMA documentation. Since I wasn't editing the document, I didn't really need the DOM interface that XmlDocument provides, and some cursory tests showed that XPathDocument was much faster than XmlDocument for parsing the ECMA documentation (about twice as fast). This improved things, cutting single-type documentation import from ~15-20s to ~10-12s. Not great, but better. Convinced that this still wasn't fast enough, I went to the only faster XML parser within .NET: XmlTextReader, which is a pull-parser lacking any XPath support. This got a single-file import down to ~7-8s. Does this mean that we'll have full ECMA documentation imported for the next Mono release? Probably not. There are still a few issues with the documentation import where it skips members that ideally would be imported (for instance, documentation for System.Security.Permissions.FileIOPermissionAttribute.All isn't imported because Mono provides a get accessor while ECMA doesn't). The documentation also needs to be reviewed after import to ensure that the import was successful (a number of bugs have been found and fixed while working on these optimizations). takiego pliku ani katalogu [ENOENT]. Seems reasonably straightforward, no? Clear errno, do the function call, and if errno is set, an error occurred. Except that this isn't true. On Gentoo and Debian, calling setgrent(3) may set errno to ENOENT (no such file or directory), because setgrent(3) tries to open the file /etc/default/nss. 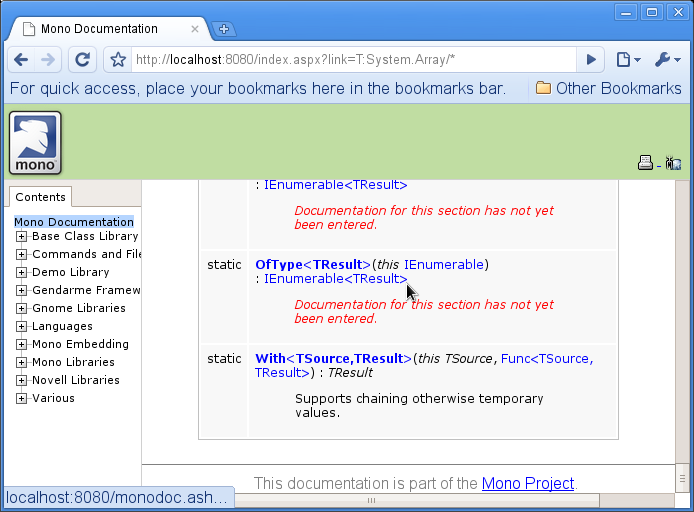 Consequently, Mono.Unix.UnixGroupInfo.GetLocalGroups reported an error (as can be seen in the above stack trace). Further discussion with some Debian maintainers brought forth the following detail: It's only an error if it's a documented error. So even though setgrent(3) set errno, it wasn't an error because ENOENT isn't one of the documented error values for setgrent(3). ...and then I go through the rest of the MonoPosixHelper code looking for other such erroneous use of errno and error reporting. There are several POSIX functions with void return types that are documented as generating no errors, and others are like setgrent(3) where they may generate an error. It's unfortunate that POSIX has void functions that can trigger an error. It makes binding POSIX more complicated than it should be. Mono.Fuse is a C# binding for FUSE. This is a minor update over the previous Mono.Fuse 0.4.0 release. The highlight for this release is cursory MacFUSE support, which allows Mono.Fuse to work on Mac OS X. Unfortunately, it's not complete support, and I would appreciate any assistance in fixing the known issues (details below). Download and install Mono 1.2.3.1 or later. Other releases can be found at the Mono Project Downloads Page. Download and install MacFUSE 0.2.4 or later. Other releases can be found at the macfuse download page. Note: PKG_CONFIG_PATH is needed so that fuse.pc will be found by pkg-config. Note: CFLAGS is used as per the macfuse FAQ. Note: You can choose any other --prefix you want. Note: MONO_TRACE_LISTENER set so that exception messages from Mono.Fuse.FileSystem will be printed to stdout. See the mono(1) man page for more information about MONO_TRACE_LISTENER. I would appreciate any assistance in fixing this issue. Mono.Fuse 0.4.1 is available from http://www.jprl.com/Projects/mono-fuse/mono-fuse-0.4.1.tar.gz. It can built with Mono 1.1.13 and later. Apple Mac OS X support has only been tested with Mono 1.2.3.1. The GIT repository for Mono.Fuse is at http://www.jprl.com/Projects/mono-fuse.git. One of the unsung helper programs for Mono.Fuse and Mono.Unix is create-native-map ( man page), which takes an assembly, looks for DllImport-attributed methods, and generates C structure and function prototypes for those methods and related types. This allows e.g. the internal Mono.Posix.dll methods to be kept in sync with their implementation methods in MonoPosixHelper, checked by the compiler to ensure type consistency. The reality is that _cnm_return_val_if_overflow() was horribly buggy and broke if you looked at it wrong (i.e. it worked for me and would fail on many of the build machines running !Linux). Consequently _cnm_return_val_if_overflow() was converted into a no-op unless DEBUG is defined before/during the Mono 1.2.0 release. Why discuss this now? Because Mono.Fuse 0.4.0 shipped with a broken version of create-native-map, which is the primary reason that it doesn't work with MacFUSE. Meanwhile, I should have a Mono.Fuse 0.4.1 release out "soon" to fix these problems, permitting Mono.Fuse to work properly with MacFUSE. The news is out: hell has frozen over. Novell and Microsoft have announced a "patent cooperation agreement," whereby Microsoft won't sue Novell customers for patent infringement and Novell won't sue Microsoft customers for patent infringement. I first heard about this on mono-list, and immediately replied with the obvious (to me) response. Note: I am not a lawyer , so consequently everything I say is bunk, but I have been paying some attention to various lawsuits over the years. Sue the distributor. This is frequently identical to (1) as the developer is the distributor, but the rise of Free and Open Source software introduces this distinction. Sue the customer of (1) and/or (2). The example I remembered hearing several years ago was Timeline vs. Microsoft . The summary is this: software patents are evil, allowing virtually anyone to sue virtually everyone else. There are no assurances of safety anywhere. Software from large companies (Internet Explorer) can be sued as easily as software from a no-name company or the open-source community (see Eolas vs. Microsoft). What does this mean for hobbyists who contribute to Mono, Samba, Wine, Linux, and other projects (like me)? It means I'm protected as part of this agreement, as my code is distributed as part of openSUSE. This also means that anyone other than Microsoft can sue me if I happen to violate a patent. What about hobbyists whose code isn't part of openSUSE? Nothing has changed -- they're as subject to a lawsuit as they were a week ago. What about other companies such as Red Hat? Nothing has changed for them, either. Red Hat is still safe, as it is a member of the Open Invention Network, which was created to deal with the potential for patent lawsuits from any party. OIN is a more complete solution for most parties involved than the Microsoft and Novell agreement, as it involves more parties. The problem with OIN is that it only covers the members of OIN. Red Hat is protected, but any distributors of Red Hat code are not (such as CentOS), and neither are the customers of Red Hat (unless the customer has a patent protection contract with their supplier). Consequently, OIN serves to protect the original developers (1), but not any "downstream" distributors (2) or their customers (3). But what about the GPL, section 7? Doesn't the Microsoft/Novell agreement violate it? The simple solution is that this doesn't apply, as this agreement doesn't touch this clause at all. It's not a consequence of a court judgment, there is no allegation of patent infringement, and I haven't heard of any conditions that Microsoft requires Novell to follow in order for the code to be freely distributed. The Microsoft/Novell agreement primarily covers their customers, not their code, so there isn't a problem. But I did stay at a Holiday Inn last night! This release contains a few major changes to the public API for consistency and clarification purposes, the biggest of which is renaming Mono.Fuse.FileSystemEntry to Mono.Fuse.DirectoryEntry (which of course required changing Mono.Fuse.FileSystem.OnReadDirectory(), again!). Some of the Mono.Fuse.FileSystem properties were also renamed for consistency. I'm still making no promises for API stability. The FileSystem virtual methods should be fairly stable, but the properties may continue to be flexible as I document them more fully (as I'm not entirely sure what the ramifications are for some of them, such as FileSystem.ReaddirSetsInode vs. FileSystem.SetsInode, and answering these questions will require reading the FUSE source). See the commit diff for specifics. Now abstract. There are no abstract methods, but it's pointless to create instances of this type, as it wouldn't do anything. Make constructors protected (to emphasize the above). Rename FileSystemName property to Name. Rename ImmediateRemoval property to ImmediatePathRemoval. Rename DirectIO property to EnableDirectIO. Rename Umask property to DefaultUmask. Rename UserId property to DefaultUserId. Rename GroupId property to DefaultGroupId. Rename EntryTimeout property to PathTimeout. Rename DeletedNameTimeout property to DeletedPathTimeout. Change types of Timeout properties to double from int; changes PathTimeout, DeletedPathTimeout, AttributeTimeout. Rename OnCloseDirectory() method to OnReleaseDirectory() (for consistency with OnReleaseHandle()). Rename Exit() method to Stop(). Rename parameters of many methods to match the method names -- e.g. OnReadSymbolicLink() takes a link parameter instead of path, OnOpenDirectory() takes a directory parameter instead of path, etc. Renamed Path property to Name. Add argument validation to DirectoryEntry constructor. Remove implicit conversion to string (as constructor may generate exceptions). Make sealed (this should only be created internally). Remove OpenReadOnly, OpenWriteOnly, OpenReadWrite properties. Mono.Fuse 0.4.0 is available from http://www.jprl.com/Projects/mono-fuse/mono-fuse-0.4.0.tar.gz. It can built with Mono 1.1.13 and later. A GIT repository for Mono.Fuse is at http://www.jprl.com/Projects/mono-fuse.git. I find naming to be difficult. What should a type be named, what should a member be named? What's consistent? What names are easily understandable in any context? What names sow confusion instead of clarity? This is why writing documentation, as annoying as it can be (lots of repetition), is also useful: it forces a different viewpoint on the subject. 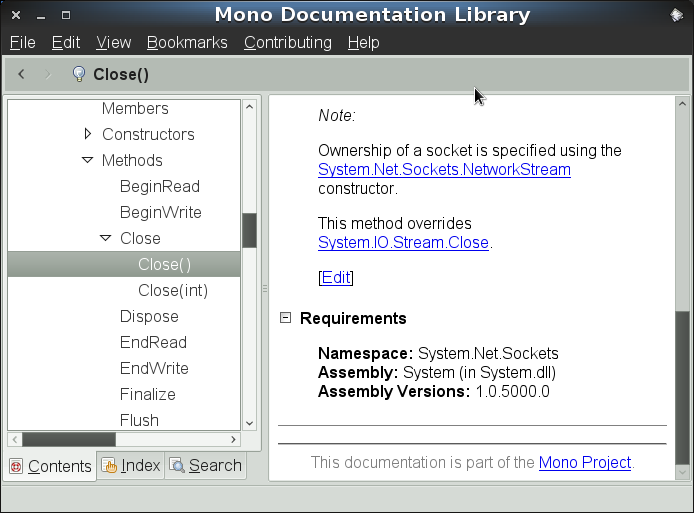 For example, Mono's monodocer program uses System.Reflection to generate an initial documentation stub for use within monodoc. As such, it shows you the public types which are actually within an assembly, not just what you thought was in the assembly, like the compiler-generated default constructors which are so easy to forget about. I've documented every public type and member within Mono.Fuse: Mono.Fuse Documentation. Consequently, the docs are only ~90% useful for the most recent 0.3.0 release, as they document the forthcoming 0.4.0 release. I hope to get 0.4.0 out reasonably soon, though I still have to write release notes. The GIT repository has been updated so that HEAD contains the 0.4.0 sources, so if you're really interested in using the current API, you can git-clone it for now. Mono.Fuse is a C# binding for FUSE. This is the third major release. This release completely changes the public API for consistency and performance. Hopefully this will be the last API change, though I would appreciate any feedback on the current Mono.Fuse.FileSystem.OnReadDirectory API. The EnableDebugOutput property has been renamed to EnableFuseDebugOutput. To get FileSystem trace output, set the MONO_TRACE_LISTENER environment variable. The Options dictionary property has been renamed to FuseOptions, as this only holds options which are passed directly to the FUSE library. Any non-FUSE-supported options will be flagged as an error. A bool MultiThreaded property has been added, and the StartMultithreaded() method has been removed. Instead, Start consults the MultiThreaded property to determine whether FUSE should be started in a multithreaded context. You can use the -s command line argument to disable this, or explicitly set the MultiThreaded property to false. MultiThreaded is true by default. Directory: methods which only act upon direcctories. File: methods which only act upon file names. FileSystem: methods which only act upon the file system as a whole. Link: methods which deal with manipulation hard and symbolic links. Handle: methods which deal with a "handle" to an opened file. Path: methods which deal with a file system entry names as strings, and thus manipulate both files and directories. FileSystemEntry: New type to associate a path string with a Mono.Unix.Native.Stat instance. Used by OnReadDirectory. UserId, GroupId, and ProcessId are now read-only properties instead of fields. ProcessId is now int, for constency with Mono.Unix. OpenedFileInfo has been renamed to OpenedPathInfo, as this type is used by both handle and directory methods. The long OpenedFileInfo.FileHandle property has been changed into a IntPtr Handle property. Mono.Fuse 0.3.0 is available from http://www.jprl.com/Projects/mono-fuse/mono-fuse-0.3.0.tar.gz. It can built with Mono 1.1.13 and later. After the Mono.Fuse 0.2.1 release, Miguel de Icaza wrote a small Mono.Fuse program that exposed System.Reflection information as a filesystem. $ cp `pkg-config --variable=Libraries mono-fuse` . Note that the above requires that PKG_CONFIG_PATH contain a directory with the mono-fuse.pc file (created during Mono.Fuse installation), and that libMonoFuseHelper.so should be in LD_LIBRARY_PATH or a directory listed in /etc/ld.so.conf. Mono.Fuse also contains other sample programs. In particular, RedirectFS-FH.cs is a straightforward port of FUSE's fusexmp_fh.c sample program, and shows a way to "redirect" a new mountpoint to display the contents of another existing directory. RedirectFS-FH.cs is actually an improvement, as fusexmp_fh.c just shows the contents of the / directory at any new mount point, while RedirectFS-FH can redirect to any other directory. At Miguel's request, I've created a version of Mono.Fuse that doesn't depend upon Mono runtime changes. This should make it possible for more people to try it out. Don't forget to read the README, as it contains build instructions and a description of how to run the included example program. I should caution that the API isn't stable (I suspect Mono.Fuse.FileSystem.OnRead should probably become Mono.Fuse.FileSystem.OnReadFile, for one), and I look forward to any and all API suggestions that you can provide. See the original announcement for more on what Mono.Fuse is (in short: a C# binding for FUSE). This is an update, releasing Mono.Fuse 0.2.0, and (more importantly) an updated set of patches to mcs, mono, and now mono-tools. The mcs and mono patches are required to build & run Mono.Fuse, while the mono-tools patch is optional and only necessary if you want to view the create-native-map.exe program. See here for all patches and an overview. The major change between this set of patches and the original set is one of approach: the original set tried to make the native MonoPosixHelper API public, which was deemed as unacceptable (as there's too much cruft in there that we don't want to maintain). copies a pointer to an existing native struct stat and copies it into the managed Mono.Unix.Native.Stat instance. There are equivalent methods to do the managed → native conversion as well. Since this approach requires making far fewer public API changes to Mono.Posix and MonoPosixHelper (i.e. no public API changes to MonoPosixHelper, as it's an internal/private library), I hope that this will be more acceptable. Here's to a quick review! Updated to add a link to the overview page. Mono.Fuse is a binding for the FUSE library, permitting user-space file systems to be written in C#. I read Robert Love's announcement of beaglefs, a FUSE program that exposes Beagle searches as a filesystem. My first thought: Why wasn't that done in C# (considering that the rest of Beagle is C#)? Stackable User-Level Filesystem, or SULF, is a pre-existing FUSE binding in C#, started by Valient Gough in 2004. It goes to great efforts to avoid a Mono.Posix.dll dependency, duplicating Mono.Unix.Native.Stat (Fuse.Stat), Mono.Unix.Native.Statvfs (Fuse.StatFS), and many methods from Mono.Unix.Native.Syscall (Fuse.Wrapper). SULF wraps the FUSE kernel-level interface, while Mono.Fuse wraps the higher level libfuse C interface. Once I started writing Mono.Fuse, I discovered a good reason to avoid Mono.Posix: it's currently impossible to use the native MonoPosixHelper shared library from outside of Mono. I figured this would be a good opportunity to rectify that, making it easier for additional libraries to build upon the Mono.Posix infrastructure. Mono.Fuse requires patches to the mcs and mono modules, changes which need to be proposed and discussed. The biggest problem with the mono module is that no headers are installed, making it difficult to make use of libMonoPosixHelper.so. Modify configure to generate a mono-config.h file, installed as $libdir/mono/include/mono-config.h. (Basic idea "borrowed" from GLib's $libdir/glib-2.0/include/glibconfig.h). Install the files $includedir/mono/posix/helper.h and $includedir/mono/posix/map.h. map.h is the current map.h file generated by make-map.exe, with some major additions (detailed in the mcs section). helper.h is the main include file, which includes map.h and declares all types/functions which cannot be generated by make-map.exe. One of MONO_HAVE_STATVFS or MONO_HAVE_STATFS would be defined in mono-config.h. A major revamp to make-map.exe. The MapAttribute attribute is public so that make-map.exe can use a publically exposed API for code generation purposes which can be used by other libraries (Mono.Fuse makes use of these changes). make-map.exe can also generate structure declarations and delegate declarations in addition to P/Invoke function declarations, allowing for a better, automated interface between C and C#. Previously, [Map] could only be used on enumerations. along with the actual implementations of Namespace_ToStat() and Namespace_FromStat(). This prefix is also used for the conversion functions. The previously internal Mono.Unix.HeaderAttribute has been removed. The HeaderAttribute.Includes and HeaderAttribute.Defines properties have been replaced with make-map.exe command-line arguments. In particular, HeaderAttribute.Includes has been replaced with --autoconf-header, --impl-header, --impl-macro, --public-header, and --public-macro (the first three modify the generated .c file, while the latter two modify the generated .h file). Finally, make-map.exe has been renamed and moved from mcs/class/Mono.Posix/Mono.Unix.Native/make-map.exe to mcs/tools/create-native-map/create-native-map.exe. Go to http://www.jprl.com/Projects/mono-fuse for the patches and source download. Apply mcs.patch to a mcs checkout, rebuild, and install. Apply mono.patch to a mono checkout, rebuild, and install. Build mono-fuse-0.1.0.tar.gz in "the standard manner" (./configure ; make ; make install). Is it OK for create-native-map.exe to be a .NET 2.0 app? How should we cope with unstable APIs which make use of native code? The Application Deployment Guidelines don't address this issue, nor the related issue of what should be done with 64-bit binaries. In particular, for an AMD64 machine, which directory layout should be used for an assembly + native lib combo? Rico Mariani recently asked a performance question: given the following code, which is faster, Sum(array), which converts a ushort to an IList<T>, or Sum(list), which uses the implicit conversion between List<T> and IList<T>. Note that the question isn't about comparing the performance for constructing a ushort vs. a List<T>, but rather the use of an IList<ushort> backed by a ushort vs a List<ushort>. The answer is, "magic." System.Array is a class with magical properties that can't be duplicated by custom classes. For example, all arrays, such as ushort, inherit from System.Array, but only have an explicitly implemented IList indexer. What looks like an indexer usage results in completely different IL code; the compiler is involved, and must generate different code for an array access. This difference in IL allows the JIT to optimize array access, since different IL is being generated only for arrays. In .NET 2.0, System.Array got more magic: all array types implicitly implement IList<T> for the underlying array type, which is why the code above works (ushort implicitly implements IList<ushort>). However, this is provided by the runtime and is "magical," in that System.Reflection won't see that System.Array implements any generics interfaces. Magic. On Mono, this is implemented via an indirection: arrays may derive from System.Array.InternalArray<T> instead of System.Array. InternalArray<T> implements IList<T>, permitting the implicit conversion from ushort to IList<ushort>. IList<T>.get_Current → List<T>.get_Current → direct T access, optimized by the runtime as a normal array access; vs.
IList<T>.get_Current → Array.InternalArray<T>.get_Current → Array.InternalArray<T>.GetGenericValueImpl (internal call). It should be also noted that because of this "magic," all arrays under .NET 2.0 have more overhead than the same arrays under .NET 1.1, because of the need to support the "magic" generics interfaces. This could be optimized to save memory, such that if you never access the array via a generic interface no memory is used, but Mono has not performed such an optimization yet. Update 2: Rico Mariani has posted his .NET performance analysis. The key take home point? "Arrays are magic." Brad Abrams, author of the Framework Design Guidelines, recently posted his precon slides for the recent PDC. I quickly read through it to see how it well Mono.Unix follows it. I also recently ran FxCop on Mono.Posix.dll, with many interesting results. Avoid having types designed for advanced scenarios in the same namespace as types intended for common programming tasks. Do ensure that each main feature area namespace contains only types that are used in the most common scenarios. Types used in advanced scenarios should be placed in subnamespaces. This is completely different from how Mono.Unix currently operates, as it places both low-level classes such as Syscall and high-level classes such as UnixStream into the same namespace. The only difference between thw low-level and high-level is the Unix prefix present on the high-level classes. This is a problem. It's a problem because when looking at the class view or the documentation you get lost looking at the dozens of low-level types such as AccessMode, ConfStr, and Syscall, as the high-level wrapper classes -- having a Unix prefix, will be after most of the types developers (hopefully) won't be interested in. My solution is to separate the low-level classes into a Mono.Unix.Native namespace. The Mono.Unix namespace will be used for high-level types following CLS conventions (such as PascalCased types and methods) such as UnixFileSystemInfo, and for .NET integration classes such as UnixStream. This change went into mono-HEAD today. All of the existing low-level Mono.Unix types have been marked [Obsolete], with messages directing users to use the appropriate Mono.Unix.Native types. Alas, some of these low-level types are used in properties or as the return types of methods in the high-level classes. These have been marked [Obsolete] for now, with a message stating that the property type or method return type will change in the next release. "Next release" in this case will be 1.1.11 or 1.2 (as I'm assuming the release of 1.1.10, which is when developers will actually see these messages if they don't follow mono-HEAD). I'm also interested in better CLS compliance in the high-level classes. At present many of them are [CLSCompliant(false)] because they use non-CLS-compatible types such as uint or ulong. Should these be changed to CLS-compliant types? Any such changes should be done now (i.e. before 1.1.10), to allow any migration time. DotGNU Portable.NET provides a .NET Curses wrapper for creating nifty console-based programs using the ncurses library. It is possible to run this under Mono. Alas, the provided configure script doesn't work very well with Mono, so we need to do things manually. The following will allow you to build Portable.NET's Curses.dll ncurses wrapper and run the bundled Frogger game. Build the libcsharpncurses.so helper library. You can ignore the warnings produced by GCC. Create a Curses.dll.config file so that Mono can load the appropriate native libraries. This file should go into the same directory as Curses.dll. I've just added the Mono.Unix documentation stubs. Next step is to start documenting the members, mostly by copy/pasting the current Mono.Posix documentation. Documentation can be out of date, especially the documentation to update existing documentation. Oops. We're supposed to use the monodocer program. The correct command to generate/update documentation is: monodocer -assembly:assembly-name -path:directory-name. The monodocer program didn't like me (it generated a NullReferenceException because of a class in the global namespace). Patch in svn-trunk.